This is a very short introductory survey of graph-theoretic properties of Boolean functions. I don’t know who first studied Boolean functions for their own sake. However, the study of Boolean functions from the graph-theoretic perspective originated in Anna Bernasconi‘s thesis. More detailed presentation of the material can be found in various places. For example, Bernasconi’s thesis (e.g., see [BC]), the nice paper by P. Stanica (e.g., see [S], or his book with T. Cusick), or even my paper with Celerier, Melles and Phillips (e.g., see [CJMP], from which much of this material is literally copied). be the binary representation ordered with least significant bit last (so that, for example, ). (The Sage method walsh_hadamard_transform is off by a sign form the definition we gave.) We will return to this example later. 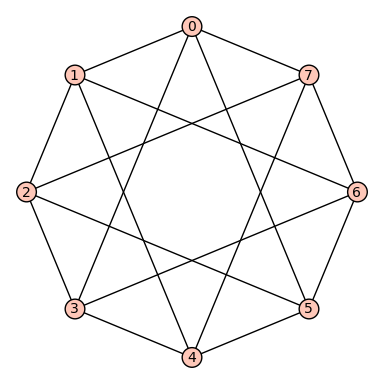 Returning to the previous example, we construct its Cayley graph. First, attach afsr.sage from [C] in your Sage session. between the spectrum of the Cayley graph of a Boolean function and the values of the Walsh-Hadamard transform of the function. Therefore, the spectrum of , is explicitly computable as an expression in terms of . [C] C. Celerier, github repository, at https://github.com/celerier/oslo/. [S] P. Stanica, Graph eigenvalues and Walsh spectrum of Boolean functions, Integers 7(2007)\# A32, 12 pages. Here are two excellent videos of Pante Stanica on interesting applications of Boolean functions to cryptography. This entry was posted in math, sage and tagged Boolean functions, graph theory. Bookmark the permalink.